The Yodock® Airport Barricade fully complies with the Federal Aviation Administration’s Circular 150/5370-2E specifications and performance standards for use in all airport movement areas such as closed runways or during construction. The ONLY airport barricade to offer top and side mount reflective tape for increased visibility. The ONLY airport barricade designed with bottom flange mounts to permanently lag or fasten. Yodock® Airport Barricades are easily stackable for convenient storage and deployment. Yodock® also offers many other airport barriers and airport barricades for various uses on airports. 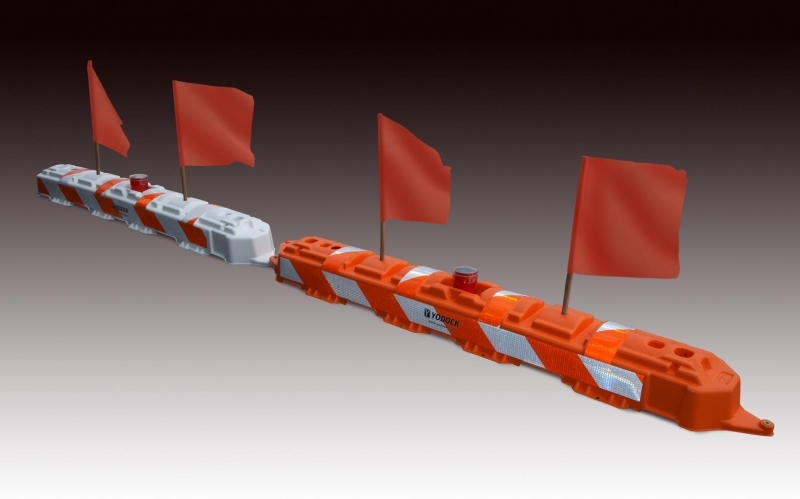 The Yodock® 2001, 2001M and 2001SL water-filled barricades have all played roles at airports depending on the location of the construction zone. Changes in regulations within the FAA, Homeland Security, and the Department of Transportation have demanded higher standards of the safety and channelization of air traffic and construction at all airports. The Yodock® Airport Curb – Airport Barricade, can meet the need for a low profile, frangible, highly visible channelizing product that clearly distinguishes a work zone from a taxi way in an airport.